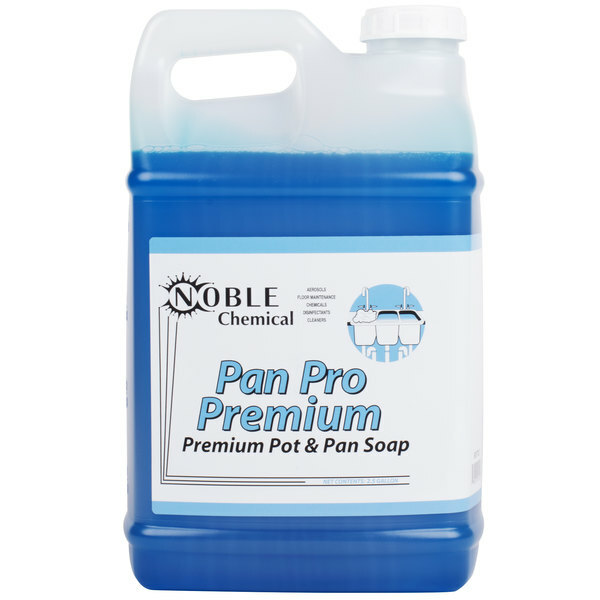 Give your pots, pans, dishes, and flatware the care they need and deserve by cleaning them with this Noble Chemical PRM Pan Pro Premium pot and pan soap. This liquid detergent is designed for institutional use where high stable foam and extra duty degreasing are required. Ideal for quickly removing lasting stains like lipstick from glasses, this solution is gentle enough to hand wash with, but also strong enough to eliminate the most stubborn grease buildups. It won't affect the head on beer, ensuring worry-free use within any bar, restaurant, or tavern. Plus, it leaves behind a pleasantly clean scent. Dilute 1 oz. per gallon of water for normal use. Use 1 oz. pan/pot for greasy jobs.